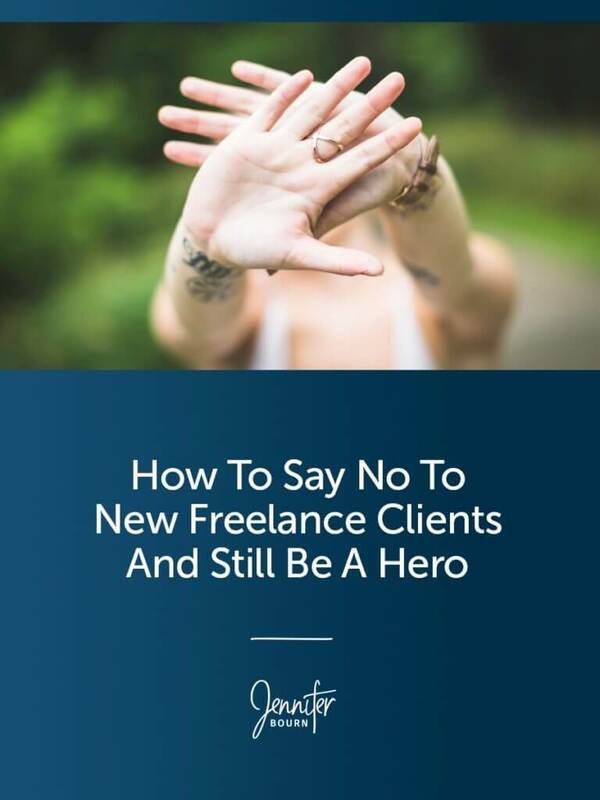 Learn when to say no to new clients and turn down new projects, discover how to say no and remain a hero, and get three email scripts to use in your freelance business. When you first start freelancing or start a creative agency, you have to say yes to all work that comes your way so you can gain experience, create a portfolio, build your ideal client profile, and develop critical business systems and processes. Then, as your freelance business or agency grows, you to get to a point where you need to turn down new projects to remain profitable. I know the idea of turning down work and saying no to new clients to remain profitable sounds crazy, but trust me, it works. When you take on new projects that aren’t a great fit or say yes to clients who aren’t a great fit, you often have to modify your processes and systems, perform more manual work, and spend more time managing the project and the client. It usually also takes longer to get projects done. Ill-fit projects and clients reduce profits while great fit projects and clients boost profits. This is why you eventually need to turn down new business that isn’t a great fit. When you say no, you make room for new freelance clients and new projects that are a perfect fit. The key is saying no to new business in a way that makes you a hero for the prospect. Some of my favorite clients to date have come from me saying no and some of Bourn Creative’s biggest growth opportunities have come from turning projects down. You see, most of the time, I turn down a project because of budget, timeline, or project requirements that don’t align with my skills — not because the prospect may be a bad client. In some cases, prospects are even showing up as raving fans who are really excited to have a conversation with you about their project. At this point, you’re the hero and even if you don’t end up working together, your goal should always be to remain the hero. No matter what the reason, whenever you let a prospect know that they aren’t a good fit, don’t send them away empty-handed. Instead be kind and helpful. While you may not be a great fit for their project or requirements, I’m sure that you have thoughts about what the prospect is trying to accomplish. Help them move forward and take action, by providing valuable and strategic tips specific to their goals and objectives. When saying no to a prospective client, consider recommending tools, solutions, or other things that may be helpful. When making recommendations, try to provide a mix of free and paid options. For example, if a prospect needs a specific feature for their WordPress site, I usually provide links to a free plugin and a premium plugin and provide information about each one. When you receive an inquiry from a prospect who has budget, but the project itself isn’t a good fit for your skillset or timeline, it’s best to refer them to someone else you trust. Now, notice I said, has budget. When making referrals to others, you want to make sure they are quality referrals because your referrals will be taken more seriously and receive higher priority if you vet them first. Prospects often don’t quite have all their ducks in a row when they reach out to a service provider to talk about their project. This makes it harder to get an estimate or quote. If you have a blog, you probably also have content that prospects will find valuable. When turning away a prospect, provide them with a few links to content that will help them move the needle. Consider sharing links to blog posts, tutorials, videos, webinars, courses, templates, podcast episodes, ebooks, etc. The two main reasons I say no to new projects and turn away new clients is to protect my profitability and maintain my brand reputation. Taking on projects that aren’t a good fit will be less profitable because they will require more of my time to manage. Taking clients on who aren’t a great fit could result in a less than stellar experience and in turn, erode my brand reputation and the ability to gather amazing testimonials. “Thank you so much for reaching out and considering us for your exciting new project. While we would love to work with you, Bourn Creative isn’t going to be the best fit to help you achieve __________. Check out StudioPress for a collection of beautiful WordPress themes that will let you get started with minimal cost. Then browse the StudioPress recommended developers page to find a whole bunch of other vetted designers and developers who can help you customize the theme for your brand. Alternately, you can check out Codeable.io. It’s a marketplace for freelance developers and a great place to start. If you need help learning how to use WordPress, be sure to check out WP101. Also, here’s a blog post I recently wrote on the 9 things you should know before creating a new website. I think you’ll find it helpful. And of course, if you ever need any advice or help along the way, or you just want a fresh perspective or feedback on an idea, I am always available for a consulting call. Thanks again for reaching and I hope this helps! “Thank you so much for reaching out and considering Bourn Creative as your creative partner for your new WordPress website. [Detail shared] sounds really interesting and I can see it making a big difference. Unfortunately, while we would love to work with you, our schedule is jam-packed right now and we’re not able to take on your project at this time. “Thank you so much for considering Bourn Creative for your [PROJECT]. We actually get a lot of inquiries from business owners just like you looking for similar features and functionality. While I could provide you an estimate and complete this project for you, there is another solution I think you’ll love that will save you a lot of money. It’s called Beaver Builder. Beaver Builder is a WordPress page builder that lets you completely customize your website and create unique and complex page layouts without knowing how to write code. All of the customizations are done on the front end of the site so you can see the changes you make as you make them. Beaver Builder even has their own WordPress theme to use as a base. When it comes to WordPress page builders, Beaver Builder is the only one we recommend. It will allow you to completely control the design of your site at a fraction of the cost. As you can see, even though I am rejecting the project in each of the sample emails above, I’m doing it in a caring, helpful way. This ensures the prospect doesn’t feel like contacting us was a waste of time and feels really happy they reached out and thrilled to have my recommendations. This approach alone has landed Bourn Creative some of our very best clients who were referred to us by people we never ended up working with, but were so impressed with how we handled the inquiry and so thankful for the recommendations, that we remained heroes in their eyes. This article was originally written for and published by Liquid Web.